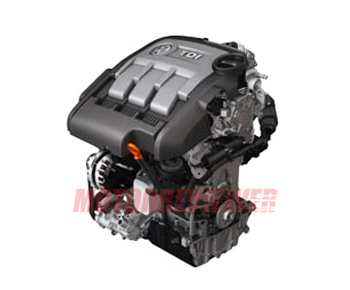 The 1.2 TDI-CR 3-cylinder diesel engine appeared first in 2009 as the new engine for the VW Polo. This engine is the result of downsizing in the engine development. The 1.2 TDI is derived by cutting one cylinder of the four-cylinder 1.6 TDI-CR engine. The cast iron cylinder block is similar to the 1.6-liter version, but without one cylinder it is shorter and lighter. The cylinder bore and stroke are the same. The forged steel crankshaft has counterweights for the first and third cylinder. The engine got balancing shaft driven by chain from the crankshaft. Balancing shaft is placed under the crankshaft in the crankcase. The cylinder head is made of aluminum alloy, and it has four valves per cylinder (two intake and two exhaust valves), intake and exhaust overhead camshafts (DOHC). Like four-cylinder TDI engines with Common Rail, the 1.2 TDI timing belt drives exhaust camshaft only, and the intake camshaft drives by gear from exhaust camshaft. The high-pressure fuel pump is driven by timing belt also. The engine has hydraulic tappets/lifters. The engine control system for the 1.2 TDI with Common Rail is Delphi DCM 3.7. The engine is equipped with variable geometry intake manifold, variable geometry turbocharger, diesel particulate filter and low-temperature EGR system. DPF problem. The engine has problems with the diesel particulate filter while city driving. Such issue often became when your driving style is too ecologically. This engine periodically needs high revs to clean out a DPF. Also, use high-quality diesel fuel to prevents a DPF clogging.